As you can see, in addition to my laptop, I have a blackberry, an iPhone, a diary and a full note pad. For the record, I am not a disorganized person. It just seems that my life has evolved into requiring all these things to do what I feel I need to do. 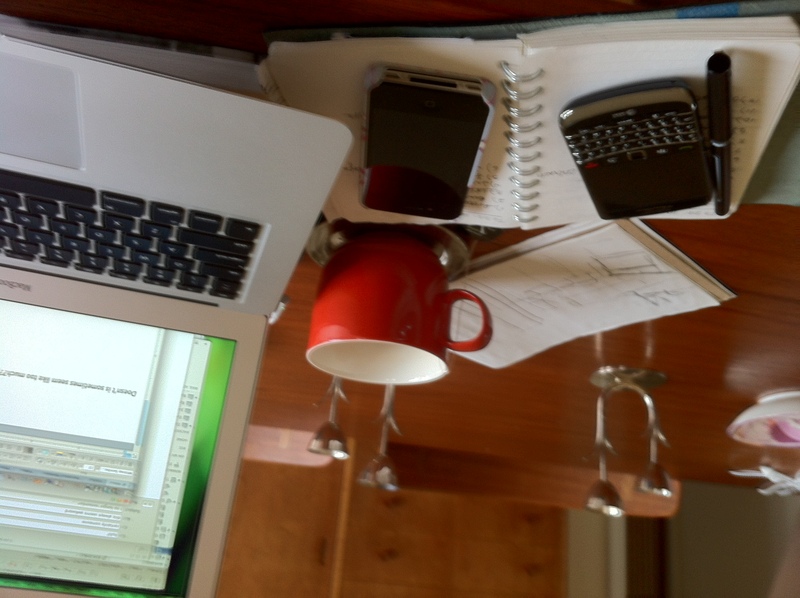 I need the blackberry so that wherever I am, I can reliably be in contact with and direct the people on my team at work. (The iPhone doesn’t really cut it for those long emails I write about contract terms, ad placements, one-off requests and the like.) And of course, I need the iPhone for all manner of personal things, including directing all the work that is currently going on at my house. The diary is needed to jot down notes because I am 40 and was brought up taking notes. I also love the feeling of the pen crossing off something on one of the three different “To Do” lists that I keep. In my book, it is one of Life’s best feelings. So, all of these things have become more important to have with me than my keys (lots of people have copies of those!) and almost everything in my wallet. And I can’t help but wonder if maybe I am doing something wrong here. I think the answer is a resounding “YES!”, but if you are at all Type A (check), have a business or demanding job (check), have children (ok, this I don’t have), like things “a certain way” (check) and are at all goal oriented (check, check), it is hard to avoid the “Too Much” Pickle. But as I round the corner into 41, I am thinking that maybe I should give it a shot. The other day I was thinking about a list I made six months before I turned 40. It was a plan to achieve various things by that fateful birthday, including (and I am not kidding): learning French, exercising at least 3 times a week, meditating at least three times a week, planning all my evenings with social and deliberate “at home” time, and a whole bunch of other stuff that was going to make me a Better Person. Inside and out. All I can tell you about that plan is that when I turned 40, I was able to say “pencil”, “the bike is yellow” and “the fish swims” in French. But honestly, what was I expecting? To achieve it all, of course! That is what we all do, right? Well, a more rational person may suggest that one must accept the fact that you can’t put everything on a schedule or a project plan. (What??) Maybe I will get around to learning more French in the next year or two. I meditate when I can, but try not not stress about it, since that seems illogical, even to me. And somehow in the last three months, I have miraculously become someone who exercises almost every day. It didn’t happen on schedule, but it did happen. And that is the trick, I guess: knowing that you can achieve a lot in this life, provided you give yourself a break here and there and recognize that, like a garden (I just met with my most excellent landscape designer regarding yet another project, so the process is on my mind), it all takes time to mature and blossom. So, here’s to our gardens –and to giving ourselves a little break so that they can grow! Mon Dieu- can I relate to this post. You are currently reading Need To Do at Some Cozy Night.